In early summer 2015, Executive Director of the Deep Carbon Observatory (DCO) Robert Hazen had an idea based upon his research. He and his colleagues pioneered the concept of mineral evolution, an explanation of how life and geology intertwined throughout Earth’s multi-billion year past. Their analyses indicated the likely existence of some minerals on Earth that, so far, mineralogists have not described. A significant subset of these undiscovered minerals should contain carbon. What if, asked Hazen, we could mobilize amateur and professional mineral collectors the world over to go out and look for Earth’s missing carbon minerals? 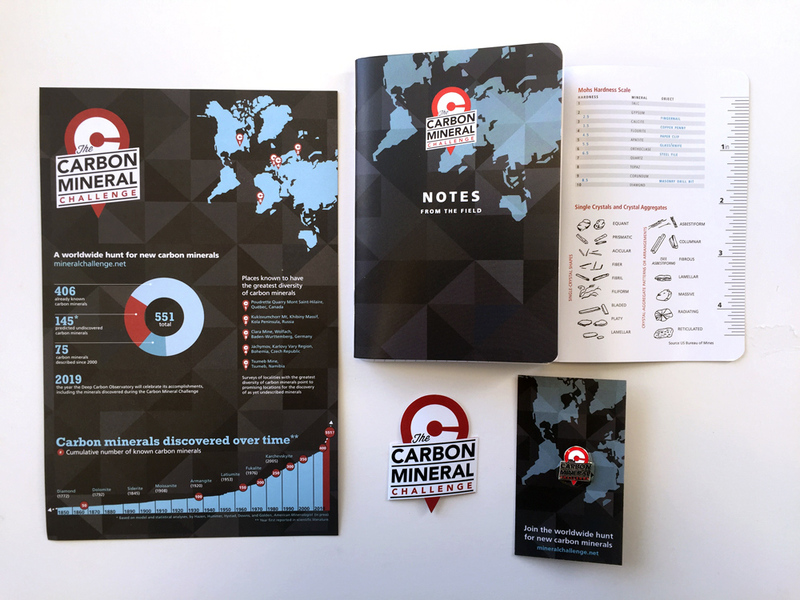 Hazen’s postdoctoral scholar Daniel Hummer, a DCO early career scientist, professional mineralogist, and keen mineral collector himself, assumed scientific oversight of the Carbon Mineral Challenge and is now the primary spokesperson for the project. Barbara Lafuente, a graduate student in Bob Downs’ lab and curator of the RRUFF mineral database, also joined the team in Fall 2015. DCO Engagement Team members all play an active role in the project: Josh Wood as lead designer, Katie Pratt as copywriter and primary media liaison, Sara Hickox as project manager, and Sunshine Menezes as press outreach advisor, with Frank Baker reviewing content and leading website QA. The Challenge was launched at an AGU press workshop at 4pm PST on Wednesday, 16 December 2015. A video archive of the workshop panel, featuring Robert Hazen, Daniel Hummer, and Barbara Lafuente, is available here. To enhance outreach activities, the team worked with Smithsonian Digital Studios to create a short video explaining the Challenge. The team also produced physical collateral (pictured right: infographic postcards, stickers, lapel pins, and field notebooks) to promote the Carbon mineral Challenge at events such as mineral shows, science conferences and other relevant events. The first new carbon minerals are already surfacing, and the team is coordinating with the IMA to arrange official announcements.